All transactions are safe and secure with a reliable history in online purchasing behind each of our associates. 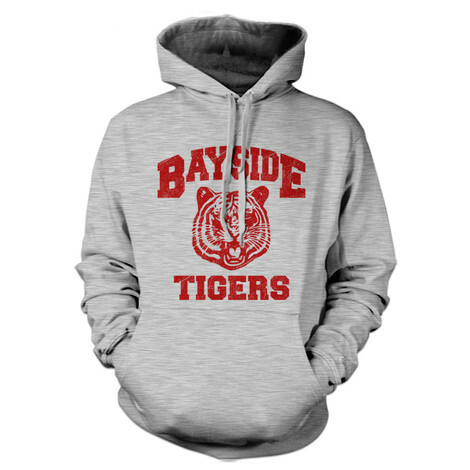 Buy the Bayside Tigers Hoodie to own Saved by the Bell clothing and merchandise. Celebrate the legendary TV series with this great Saved by the Bell hoodie sweatshirt that's perfect for chilly summer nights. The show does not take place in the real Bayside, California in Humboldt County. Instead, the show is actually set in Pacific Palisades, California, with the characters attending the fictional Bayside High School. These Saved by the Bell t-shirts celebrate the establishment presided over by Mr. Belding. The design is available on a variety of Saved by the Bell apparel items. In addition to the Bayside Tigers Hoodie above, browse the Saved by the Bell Clothing Gallery for more apparel like men's and women's clothes, kids shirts or hoodies.